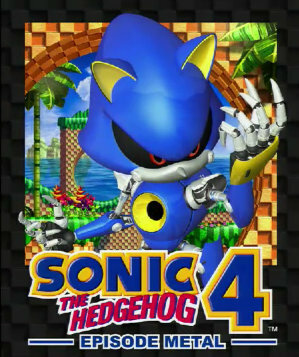 Sonic the Hedgehog 4: Episode Metal is a free downloadable "Lock-On" part of the episodic game Sonic the Hedgehog 4, released along side of Episode II. It enables any player who owns both Episode I and Episode II on the same console to play Episode Metal, thereby acting very similar to the Lock-On Technology pioneered by Sonic and Knuckles. Episode Metal explains the backstory to Metal Sonic's return in Episode II and also serves to connect Sonic 4 to Sonic the Hedgehog CD, befitting the latter game's recent re-release on digital download services. To access Episode Metal, the player must beat at least one Act (so, for example, you could simply play only Sylvania Castle Zone Act 1) of Sonic 4: Episode II, and then again choose Single Player; now, Episode Metal can be selected from the stage select map by switching to the Sonic 4: Episode I map. Sonic 4: Episode Metal is set after the events of Sonic 4: Episode I and before Sonic 4: Episode II. Dr. Eggman sends a probe out to the fabled Little Planet to find the remains of Metal Sonic, who is languishing in Stardust Speedway after having been defeated there by his target and the inspiration for his design, Sonic the Hedgehog. After locating Metal Sonic, Eggman remotely shocks him back to activity and instructs him to return to Sonic's world, which in Episode II is at its closest point to the Little Planet since the time of Sonic CD. Metal flies to the world, and there he begins his journey to return to full power and face Sonic once more. This act shows that Mad Gear was built to help restore Metal to a battle-worthy state. At the end of the act, Metal Sonic finds a hidden power in the labyrinth that gives him his purple charge attacks. At the end of this Act, Metal Sonic finds the rocket that Sonic used in Episode I to reach the E.G.G. Station; Metal Sonic then uses it to catch up to Sonic, who is now in Episode II's second Zone, White Park. Episode Metal implements Episode II's physics in Episode I's Zones. The new Acts have layouts modified from those of Episode I, making Episode Metal something of a 'hard mode' version of Episode I. This could be considered similar to Knuckles the Echidna's routes in Sonic 3 & Knuckles. This page was last edited on 19 September 2018, at 01:23.